Super Seniors Win for Ali Kelly! 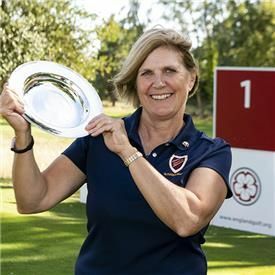 Gloucestershire’s very own Ali Kelly came from four shots off the pace to become the first winner of the England Senior Women’s County Champion of Champions’ title at Frilford Heath GC. Ali from Cirencester, finished the 36-hole event at Frilford Heath Golf Club, Oxfordshire, on six-over par and won by two shots. Ali was delighted to win the inaugural competition, as when she played in the County's Senior Champs she wasn't aware that there was an England Golf Champion of Champions event for senior ladies. Her win was made even more special because it was at Frilford Heath – where Ali's parents were members until recently – and because the trophy was presented by England Golf President-elect Jenny Clink, a stalwart of Gloucestershire women’s golf. After yesterday’s first round Ali was four behind but she decided to just go out to have a reasonable game and not think about winning particularly, but have a tidy round. Well done Ali - we're all very proud of you!